The Sims is now an Amazon Alexa skill Great news for Alexa users. It now supports Sims 4. Players must connect their Origin account with Amazon to use full Alexa's power. What it can now: Play hours of The Sims music. 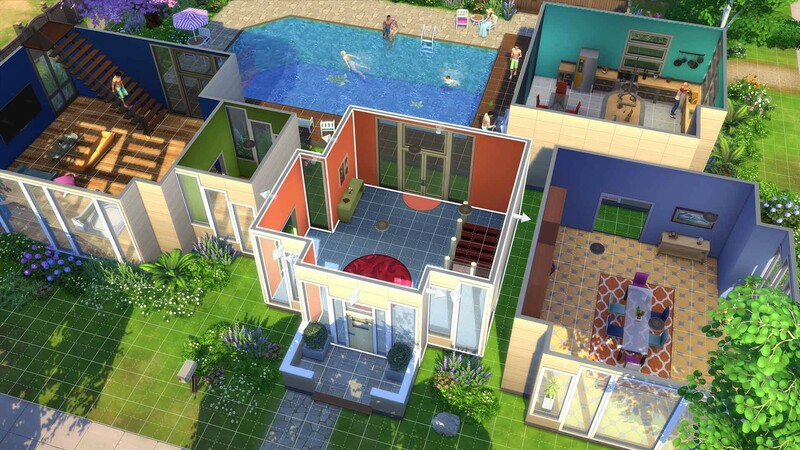 EA developers collected 140 songs from The Sims 3 and The Sims 4. You don't need to start the game to listen to favorite music. Talk about The Sims. Alexa knows over Sims-related brain-busting questions to check how good your game knowledge is. Get more about The Sims. Alexa knows hundreds of interesting facts about the Sims game. But, that's not all. PC and Mac players now have a new device in their virtual homes - Liz-Z. It is a digital personal assistant that can even more than real Amazon Alexa does. Don't hesitate. Try new Alexa features and Liz-Z right now. Enjoy Your New Urban Life In The Sims 4 City Living Reveal the perks of living the urban life. The city life opens new possibilities in front of your Sims character. Start the new page in your life by moving into an apartment in San Myshuno, the big city that never sleeps. There is a new expansion in town. And it is about city life. While we all are familiar with Sims games, developers offer something cool and different in City Living. Graphics are vivid and colorful as always. Sims are still talking funny on their Sims language. Music is relaxing and inspiring. It does not bother you while you are playing. Navigation is familiar. Nothing has changed since you played Sims last time. The whole idea is to improve the life of your Sims character as old as Sims world. And yet, there are a lot of new things. Few words about the city San Myshuno reminds of the New York City or Shanghai. It has Myshuno Meadows Park right in the center which looks similar to Central Park. And yet, it has very own Sims-like atmosphere. Unlikely it was copied from any particular city. There are lots to discover and see, walking through 5 neighborhoods: Fashion District, Meadows Park, Arts Quarter, Uptown and Spice Market. Rent an apartment in Spice Market or Arts Quarter, as these two areas are less expensive. Still, they are the most atmospheric. If you are a creative person, you would love the whole bohemian rhythm of life in these quarters. Arts Quarter completely meets its name. There are all kinds of artists and musicians living their lives, entertaining audience on festivals like Hijinks or Humor fest. Spice Market is a place for everyone. There are Sims from South and Central America, Asia, India. It organizes Spice Festival, which celebrates ethnic diversity of the city. You can go to Flea Market and find a real treasure there. Fashion District has lots to offer for those who are looking for luxurious and expensive apartments. It also hosts numerous outstanding events like Geek Con and Romance Festival. The food there is either Filipino or American. The most expensive district is an Uptown. It is the place for the most powerful Sims in the city. There are no food carts, no festivals. Life there is quiet and peaceful. Apartment question It sounds weird, but in Sims, even apartments have its bright personalities. Apartments are a big deal in this expansion. They may ease your life in the city or make it more complicated. The cheaper your apartment, the bigger problems you have. You will have to fix pipes, electricity, replace furniture, etc. Neighbors have no trouble to wake you in the middle of the night by listening to music or dancing. While the city itself is bustling, each of the districts gives you an illusion of completely open world. You may want to check all the possibilities you have in the districts. Start with a small apartment or share it with a roommate. It may turn up to be a really great adventure. Expensive apartments may come with unexpected features like being close to the Ley Line, so your Sim’ female character may give birth to twins. Professional kitchen in the apartment automatically increases the quality of the food. Change colors and decorations in your apartment as much as you want. Still, there are no options that allow you to change its shape or expand since you are renting it. So, do your best, save your money and buy a penthouse after all. Beware! There are no basement options for penthouse owners. As for the others, you may even build a pool there. New careers Sims 4 City Living gives your character a chance to try something new. Some of the careers, like Politics, Critic and Social Media offer you the chance to work from home. You can finish tasks wherever and whenever you want, just follow the time frame. At first, you will receive easy assignments. And your career will progress quickly. But with every new promotion comes more duties. Work can push Sim from the comfort zone. Try remote jobs and complete daily tasks at your pace. Don’t worry, each of these jobs offers different ways to play. There are minor changes in gameplay as well, which you may find interesting. You can raise your singing skills with lots of practice in karaoke or shower. If you hate your neighbors, that’s a great way to make your revenge. Another addition to the game is the ability to paint murals. Master your painting skills and create some beauty on the streets. Now you can make a political statement with the art and later deface it. If you are not really in politics, try basketball. It is a nice addition to the sports section of Sims. This is a nice urban way to expand the athletic skills of your Sim. You can meet new friends there as well. New options like Vegetarian and Unflirty may not be crucial in the game but makes the characters realistic. It feels better to have such options or play for a character that looks like you. New things like different furniture, clothes, hair usually arrive in packs. Still, there is no mirroring of the modern people’s styles. It looks like Sims 4 is focused on hipsters. So, if you are not one of them, you will have to look hard for a new outfit to express yourself. As for the objects, they are definitely cool and completely creative. Just look at the Japanese futuristic smart toilet. CAS editions bring more diversity in Sims-style and underline variety of world cultures. There are headscarves that look amazing on characters. New colors came to the wardrobe. Now it looks like you are in the middle of London, Paris or Tokyo. There are lots of clothes inspired by Asian culture. Children in the game still don’t receive as much attention as it could be. Still, there are nice extra clothes for them. Festivals There are numerous festivals you may attend in the city. Each district has its own festival to offer, as you can read it above. It is a very significant addition to the game. Festivals make Sims more interesting. There is a board outside your flat you may want to check. It has all the information about the upcoming festival you may visit, including location, time and activities you can take part in. You can make a performance there or just go to try new food. Humor & Hijinks. You can earn points on Humor and Hijinks festival by making a stand up performance or be a prankster and gain points for Voodoo Doll prank. Spice Festival invites you to try the best examples of spicy food, from burritos to curry. You can challenge yourself and eat the spiciest bowl of curry. Don’t forget to buy unique souvenirs before you leave. If you are not into spicy food, you may take part in harvesting fresh vegetables and fruits. Geek Con offers multiple entertainments, like Hackathon where you can try your skills as a hacker or game testing. Sims challenges you to pass gaming test and receive scores. If you are more into space, you can build a rocket and explore the Universe. At this festival, your skills are developing faster, as you are surrounded by the greatest minds of your time. Flea Market is obviously about buying or selling unique stuff. You can find some treasures there. To get the best price you’ll have to haggle. If you have too many treasures at your apartment, set up a small shop at the festival and gain the money. Romance. Try delicious Sakura tea, that festival offers, and feel yourself in a romantic mood. In a few seconds, you will want to scatter petals and throw them in the air. Romance festival have a wedding arch, so you can propose to your soul mate and get married immediately. And you even do not have to worry every minute that you’ll miss the festival. When it is on, you receive extra notification, so you may travel directly to the place. Notification is a lifesaver since you can completely forget about the festival or its location. Festivals may turn in a routine after 6-7 attendances. Still, you can try each of them. It will take some time until you will be able to attend one festival 6 times. The benefits you may find in the game City San Myshuno is a brilliant playground and the best idea that game developers could ever come up with Every apartment has its own unique atmosphere, neighbors, perks and problems you will face during the game Sometimes relations between you and neighbors turn into a sitcom inside the game. It can be really hilarious to watch There are new careers in the game and more options to express your individuality there Problems that may appear Let’s talk about glitches in the game. Since Sims is a Universe-size game stuffed with thousands and millions of options, it is only natural that there are some gaps. You may find them rather minor. The camera rarely gets crazy. Festivals may get boring with some time, but we still don’t know that. Sometimes it can be disappointing when your Sim invited out, but the event doesn’t start. Well, it is possible in real life, so why we all are so worried to see it in the game? This extension looks more realistic, so let’s pretend it was made on purpose. Summing up: The Sims 4 has its minor glitches as well Clothes and hair additions could be way better and more diverse Conclusion Sims world is developing and expanding non-stop. It gives gamers more possibilities and attracts a new audience. The Sims 4 City Living introduces us to an extraordinarily interesting city San Myshuno. Now we can discover it step by step. Everything You Did and Didn’t Know About The Sims 4: Get Famous The first expansion pack entirely dedicated to the superstardom since an old fan favorite The Sims: Superstar, The Sims 4: Get Famous is probably the most amusing adventure in the series to date. It was released on November 16, 2018, and got positive reviews from the main video game media resources and ordinary players. Alongside with new fame gameplay system, it contains the wholly new world of Del Sol Valley, acting career and some additional content. The developers prepared the audience for the latest expansion with the free game patch dedicated to the building of a Style Influencer career in the Sim world. Your Sim could choose between Trendsetter and Stylist branches, and there were a couple of additional terrain objects. The previous official expansion pack for The Sims 4 was Seasons. It concentrated on the nature and the beautiful world around your characters with its weather changes and holidays for every season. So the expansion that would emphasize the Sims and their life opportunities was highly anticipated. Just like in The Sims 3 there was a Katy Perry Sim appearing in random places all over town, The Sims 4: Get Famous has Baby Ariel, a singer that is known throughout social media with her hit single “Aww.” Del Sol Valley This expansion pack contains new Sim world named Del Sol Valley, a suburban area reminding of Hollywood Hills. It includes Mirage Park, The Pinnacles, and Starlight Boulevard neighborhoods, and one secret lot Plumbob Pictures, which is available only for the Sims with an Acting career. In those neighborhoods, there are many career-influencing lots like studios, lounges, and gyms, as well as parks, museums, and other leisure public places. It looks very LA-styled with its long suburban streets and mild climate (even if you have Seasons expansion, there’s no snow in winter). There are three Sim-generated families you can play: a starlet actress Venessa Jeong, a greedy star Judith Ward, and an influencing Bailey-Moon family. Acting and Fame Acting career is introduced with a new acting skill that you can improve by practicing with mirror and microphone. Sims with higher levels of this skill also make better interlocutors and can save boring conversations. Your career starts with auditions for commercials that require you to develop your skills of Charisma and Fitness (apart from the main Acting skill) and sometimes you will also need to make friends or have dinner with somebody in the crew. And it gets more difficult with each new level. When you finally get the role you can choose the style you want to act it. You will also need to get into a costume and make-up for the part, which is itself quite fun. Kids can choose Drama Club as their afterschool activity to develop their acting skills from childhood. Fame is the new feature of the Sim world that is partly based on Celebrity feature in previous chapters. Fame is gained by actors from their gigs but is available to many careers that are related to performing, making publications or interacting with many people. It can be exhausting to attain, and keeping it is even harder but it adds a lot to the gameplay mechanics. There are several levels of fame: You can choose ‘Quit the Spotlight’ option to build your career quietly. If you don’t, you begin your way to stardom on the ‘Notable Newcomer’ level, which is a little bit better than being a crazy fan and opens up some locked perks. The next one is the ‘Rising Star’ level, which the highest level for children celebrities: they have a higher friendship value, can give autographs and pose for the cameras. ‘B-Listers’ give hugs to fans and make selfies with them, they also have a ‘Celebrity Disguise’ option to escape public attention. Then there’s a ‘Proper Celebrity’, which is someone with its own famous walk and a fame shine, they can cheer up their fans by just showing somewhere around. The highest level celebrities are ‘Global Superstars’: with the high status and a huge number of followers they also get their own ‘Celebrity Tile’ they can make an inscription on and place it on the Starlight Boulevard. The tiles stay on the Boulevard no matter what happens to the star. The more famous your Sims get the worth their quirks become: from juice drinking problem to anger issues. Besides, your star Sims need to go out as often as possible and make Simstagram posts to feed the public with some rumors. But don’t panic yet! There are perks that help your celebrities to remain in the spotlight; they open up gradually as your career grows. Fame is usually connected with your reputation. Sim reputation can go through seven stages from Pristine to Atrocious. Everyone starts with a neutral reputation, and it takes some effort to change it for better or for worse. Other New Features Besides acting, there’s a media production skill that allows your Sims to produce two types of media: video and music. They can make and remake video and audio tracks with the help of Mix Master Music Station and More Views Video Station and upload them on their Internet channels. For the new unique locations and the old ones alike, you will also find new traits: Celebrity Home, Up-And-Coming-Hotspot, Hottest Spot in Town, the behavioral patterns of your Sims and non-playable game characters. The list of non-playable characters for the game has also expanded: now there are other actors, A-list celebs, bouncers on the entrances to hot spots, fans, directors, make-up actors, and paparazzi. Two new types of aspiration appear in the game: World-Famous Celebrity is connected to your Sim popularity and Master Actor to their creativity. There’s a set of new options for Create a Sim mode, such as scars and gold teeth. From now on your Sims can attend blind dates and give their residence keys to best friends. There's also a couple of new location for making out: money vault and sleeping pod. A new radio station dedicated to hip-hop appears in the game. There’s a set of great new objects that add glamour and depth to your game: Bouncer doors; Celestial Crystal Crown; Drones; Green screens; Money vault; Music station; Styling station; Sleeping pods; Stage props; Vault door; Video station; Wardrobe platform; Water garden. The final touch is added with a particular Self-Absorbed trait: Sims who have it strongly need social interactions and get tense without compliments and gifts. Highly Recommended The Sims 4: Get Famous is the latest and the most entertaining expansion of the Sim world to date. The fame and stardom mechanics are quite challenging to keep up with, especially if it’s your first Sim game. A great deal of micro-management is needed, so if you like to set your Sims free and just watch their lives go by, the fame rush may exhaust you. Still, there are so many tiny beautiful details to the game that even if your Sim fail as a star, you’ll have a fair share of amusement and cheer. The gameplay is so smooth and charming, and the locations are filled with such light-hearted irony that it seems almost impossible to surpass. So let’s wait and see what EA games have up their sleeve for The Sims 5. HOLIDAY UPDATES HAVE ARRIVED Happy holidays, Simmers! We hope you haven't forgotten how happy you were with the Christmas gifts. Surprises always make us feel the holiday atmosphere and our mood rises immediately! The same effect gives us new stuff! * That's why we are happy to provide a fun update for The Sims ™ 4 Holiday Celebration Pack *, to make you happy these cold, frosty winter nights. Let’s begin with some rustic décor to freshen up your Sims’ decorating arsenal. Spruce up a festive table with mason jar candles and delight dinner guests with snowflake garlands. Plus, don’t forget to bundle up in some cozy winter clothing, perfect for snuggling up by the fire. To top off all that holiday goodness, The Sims Mobile is also getting into the holiday spirit. This year, Parkside, Market Square, Downtown, and Waterfront are decked out to celebrate Winterfest. There's a Holiday Quest happening now where you can earn currency (candy canes!) to get special winter and holiday-themed rewards. Plus, during this time, Sims can go ice skating. Lastly, we’d like to thank you all for your support, creativity, and dedication to The Sims. We are all truly honored to be a part of the community. Have a safe and fun holiday, Simmers! P.S. Yes, that’s a yeti sipping some Calming Chamomile. We highly suggest patching your game right now if you’d like to hang with this fuzzy house guest. *Requires The Sims 4 game (sold separately) and all game updates to play. Hello everyone. We are the biggest The Sims 4 game fans. Here we collected all useful information about this game. We provide the honest review, walkthrough guide and tips, news about updates and future release on Playstation 4, Xbox One, Xbox 360, Android and Nintendo Switch. Also, we are working on the community category that will be released in the nearest future. Play The Sims 4 and join our fan community. (C) 2019 The Sims 4 Fansite. Honest review and useful walkthrough guides. All Rights Reserved.